Hey everyone! Today I another review from Born Pretty Store, a 20pcs set 1.1mm triangle studs. Lately I have seen these studs in the nail art community, and I'm excited to finally get to use these. 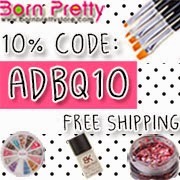 Born Pretty Store has tons of amazing inexpensive nail art tools and accessories. With tons of new arrivals every other week, especially studs, which is exciting to look through. The studs I chose, comes in a small plastic sealable bag, with the size 1.1mm (B2) triangle studs. Available in two colors: Gold and Sliver, you can purchase them here. Since they are a bit smaller, might want to be careful some will get lost. For this design, I wanted to be a bit simple and fitting for the season. For this look, I started by applying two coats of Cirque Colors Carpe Diem and Essie Blossom Dandy on the ring finger. Once the base was completely dried, I added a few florals and green acrylic paint for the leaves, with Pure Color #9. I then add a few suds creating a unique looking star in the middle of the nail. Lastly, I sealed the nails with H K Girl Top Coat. Overall I really loved how these turned out, the studs were super cute and intricately different. I will definitely be using these again. These are available on Born Petty Store website, for $2.58. Be sure get one!